For the love of Africa. Yesterday, I attended the Africa Now! 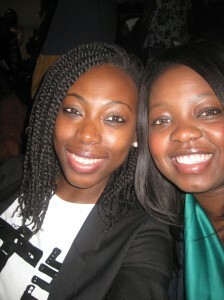 Concert with my Beninese friend at the historic Apollo theater in Harlem, NY. The feeling of being at a venue where much talent has been found and celebrated is indescribable. But what caused a stirring in my soul was being there to celebrate great African talent and all the possibilities they imbibe. I’d been craving some new tunes in my life and so was pleasantly surprised to encounter South Africa’s Freshly Ground, an eclectic band which is fun and musical genius set on a bunsen burner. I also enjoyed Lokua Kanza from DR Congo (who performed with his daughter and brother!). His words “Il ne faut jamais perdre ton ame” (Never lose your soul) rang loud and true, as did his humility and “ubuntuness” (he kept thanking one friend or another for one thing or the other). His voice reminds me of Senegal’s Youssou Ndour. And then there was Nneka (Nigeria) and Blitz the Ambassador (Ghana), both of whom I greatly admire and place under my self-created genre of “conscientious music”. Their songs reignite my hope and passion for L’Afrique. Africa Now! was a beautiful experience and I hope it continues in Harlem and beyond. 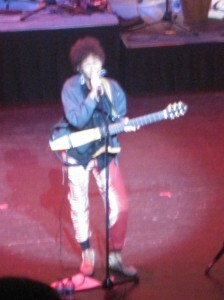 Nneka’s performance was raw. Blatantly and unapologetically honest. Even though there wasn’t much time for her to elaborate on the genesis of her songs or her background, her emotion was equally raw and written on her face. Talk about electric. Having been a long-term fan or her music, I must say her live performance is eons above her recorded stuff. She is a ball of fire, small frame notwithstanding. At some point during the show, she told the technical people over mic (and for all to hear) that something wasn’t working the way it should. She then turned back to the audience and went “Sorry, I’m not professional. When I have a problem, I have to say something o”. Guts. Can you imagine what the world would be like if we all spoke our truth respectfully? As I was sitting there listening to this woman who has experienced God-knows-what, I was thankful. She was sharing her story and we, the audience, were taking it in. And not just taking it in; mini light-bulbs were going off all over (not that I could see them :P). We share so many common struggles, why then do we focus on the rifts? Put people in boxes, label each other this and that. I struggle to understand that, and I guess it’s pointless to even try. Something’s are simply meaningless. Point is, Nneka was relaying her words to us in song and it was making an impression. That impression was spurring up electric energy and thoughts, which could lead to words or expressions of self, and acts to realize those expressions. Read. By extension, all Muslims are commanded to “Read” – and contrary to what mass media would suggest – to learn, seek knowledge, go out and create better versions of themselves. Read. One command, and the creation of a community of over a billion was sparked. Thinking about all that just leaves me speechless. The power of word. It’s something we pay little mind to, underestimate – sometimes until it’s too late – but over centuries it has remained a very potent force. What words do you speak/sing/read/think? Do you speak words that uplift (yourself, others) or do you speak words that depress? What words do you read? Do you read things that demotivate or words that inspire? What words do you listen to? What words do you sing? What words do you think about/reflect on? Look around you – which words spurred the creative process to where we all now? Thought –> Word –> Action. There’s power in word. Don’t underestimate it.